St. Mary Magdalene Catholic Church is looking for fun, dedicated individuals who enjoy the game of basketball and want to share their faith with our youth. 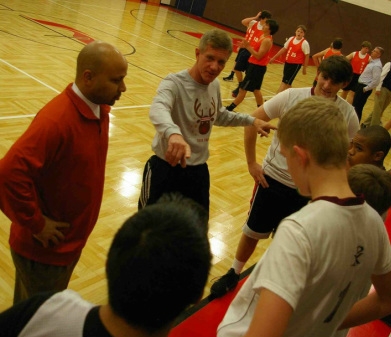 Your coaching skills go beyond the fundamentals and strategies of basketball. You are also teaching our children how to set goals, take responsibility, respect others, exhibit self-control, and how to reason through complicated situations. Most importantly, as John Paul II said, "Every Christian is called to be a witness to Christ, that is, a faithful and courageous witness to his Gospel." Please consider volunteering as a head or assistant basketball coach. Traditionally, our greatest need has been with our 15-18-year-old children (As they become more independent – driving – there's less parental participation). If you are interested in coaching, please fill out the Coaches Registration Form and register for Safe Environment (charleston.cmgconnect.org). If you have questions about Safe Environment﻿, email safeenvironment@smmcc.org. Remember: Without a coach, there is no team. We also welcome other volunteers, such as team parent, scorekeeper, fundraising leader, office support, carpool volunteer, and help with photography and videography. Dedicated volunteers are vital to our program. Thank you in advance for donating your time and talents. All coaches are required by the Dioceses of Charleston to attend Safe Environment training. To register, please go to Safe Environment (charleston.cmgconnect.org). If you have questions about Safe Environment﻿, email safeenvironment@smmcc.org.